Or at least inspired by Godzilla. Every Friday they have TGIF (Thank Godzilla it's Friday!) on one of the cheap pay channels. So I've been watching and hoping they revive my childhood hero so I drew up a quicky idea. I loved the American monster (movie was bad, but monster was cool) but I think it was too slender. It HAS to have the radioactive fire breath! Is yours friends with other monsters or their bane? I picked up 1985 and Against Mechagodzilla a few weeks ago, and revisted this old friend of mine as well. Good times, good times. I like the mean Godzila. The jumpy happy one is not my favorite. I saw a Godzilla, Mothra and Gidarah move from 2001 I think. That was a god one. I do like the original a lot and the one where the old Godzilla dies. NICE! Its been a while since I've checked the blog, very cool take on Godzilla. The patterns are a nice touch. Godzilla is a spinosaur, megalosaur or a ceratosaur? The original move said it was an Allosuar. 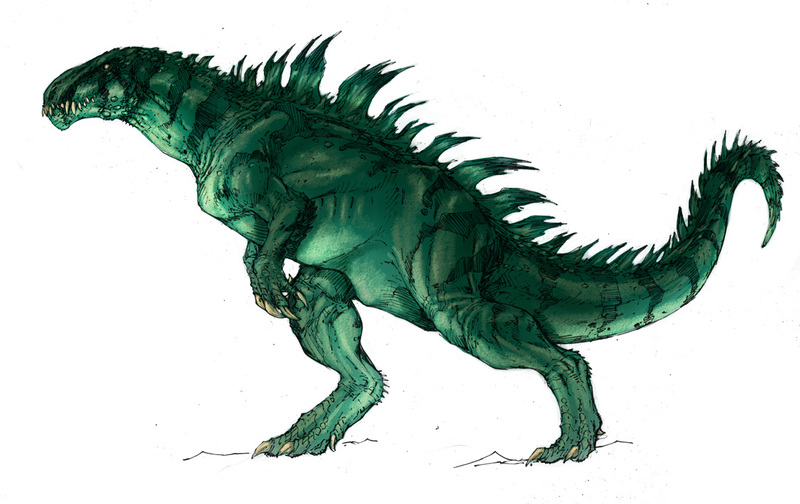 Did you made a Titanosaurus draw from the Terror of Mechagodzilla (1975)? I am just curious what it would be this creature (the titanosaurus) that's your style. I think the titanosaurus looks like a mutated spinosaurus. I'm guessing you watched "Godzilla: The Series" too? It's 1 of my favorite nostalgic tv shows.